I believe that the term lords of cycles would be translated today as masters of dimensions, or interdimensional facilitators. Those 7 Lords of Cycles (or interdimensional facilitators), I believe, were the same Seven around whom this series of articles is written and who, after the demise of Atlantis, played a key role in the emergence of ancient Egypt. 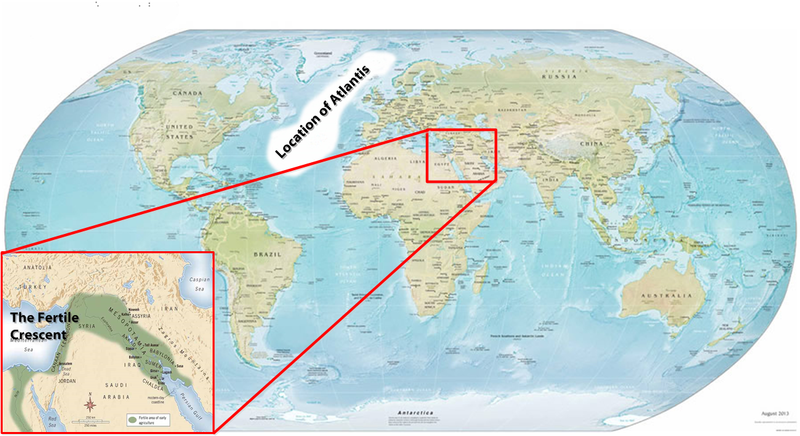 The final destruction of Atlantis probably happened some 10-12,000 years ago (read more…), leaving only a few scattered remnants of that great civilization in and around what is now Europe and the Middle East. The job of Thoth and the other surviving Atlanteans was to pull things together from the rag-tag tribes of noble-savage humans on Earth… to usher in the Second Epoch of humanity… but it didn’t happen overnight. Photo by Félix Bonfils (1831-1885), his wife Lydie (1837-1918) and their son Adrien (1861-1929). 5000-3000 BC –Agriculture was mastered by taming the annual flooding of the Nile River. Warring tribes were unified into the Egyptian nation-state, and the inventions of sailing ships, writing, and the calendar were among the many breakthroughs of the time. 3000-1000 BC – This was the great era of Egyptian civilization, when many of the temples were constructed, with lavish sculptures, architecture, and paintings. 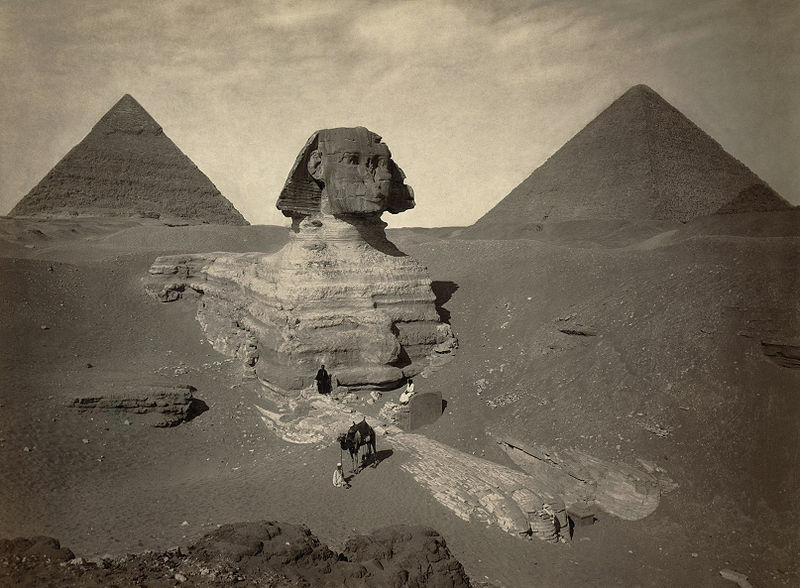 Most modern historians also believe that this era included the construction of the Great Pyramids (… although I have the sense that those highly advanced constructions probably happened earlier… nearer to the demise of Atlantis… since the Sphinx in that later era <circa 2600 BC> was already partially buried in sand. Some of the pharaohs of this later era may have been reincarnations of the demigod Thoth, including perhaps Amenhotep or his son Thutmose, whose name means “Thoth reborn” or “born of Thoth”). Drawings of ornate Egyptian architecture by Karl Richard Lepsius (1810–1884). 1000-0 BC – Egypt was conquered by various other civilizations, finally being absorbed into the Roman Empire. I learned, from the Lords of Cycles, wisdom brought from the cycles above. They manifest in this cycle as guides of man to the knowledge of ALL. Seven are they, mighty in power, speaking these words through me to men. Time after time I stood before them, listening to words that came not with sound. Thoth, I believe, was in a rapport with The Seven ethereals, not only during his long life in Atlantis but also during his work in Egypt, starting around (or maybe long before) 10000 BC. That rapport was most likely held in high esteem among the Egyptians as their civilization evolved under the guidance of Thoth. The Egyptians developed a large pantheon of gods, probably inspired largely by Thoth and his teachings. At the top of the pantheon was Ra, popularly regarded today as the Egyptian sun god, but also regarded by the Egyptians as the creator of everything. That was probably too weighty a concept for the human mind to grasp in those ancient times… so people correlated the concept of God to the sun in the sky… which to the five human senses, unfettered by modern scientific knowledge or timeless spiritual understanding, really does seem as though it could be the source of everything. Ra, then, was most likely the Egyptian name for God, or the central source. The goddess Hathor was also at the top of the Egyptian pantheon… regarded at various times by various Egyptians as the mother, the wife, or the daughter of Ra. She was a goddess of love, joy, and abundance. (Picture of Hathor, by Jeff Dahl. Permission is granted to copy, distribute and/or modify this image under the terms of the GNU Free Documentation License… see details). The Seven Ethereals told us (INIT members) that they were assigned (presumably by finer beings close to the Source) as gatekeepers between humans on Earth and humans in the afterlife. They were in charge of facilitating the miraculous communications we received through our ITC bridges in the late 1990s. Hathor, likewise, was often viewed by the Egyptians as a goddess close to Ra… a go-between for heaven and Earth. During the fall and spring equinoxes 5,000 years ago, the Milky Way cluster of stars in the night sky seemed to touch the Earth both in the east, where the sun rose, and in the west, where the sun set, as though it were a heavenly river flowing to Earth, and sailed upon by both Ra (the sun god) and the moon. The ancient Egyptians often called the Milky Way “The Nile in the Sky.” Hathor was the goddess most closely associated with the Milky Way. Hathor was later associated with the goddess Aphrodite (by the Greeks), and with the goddess Venus (by the Romans). 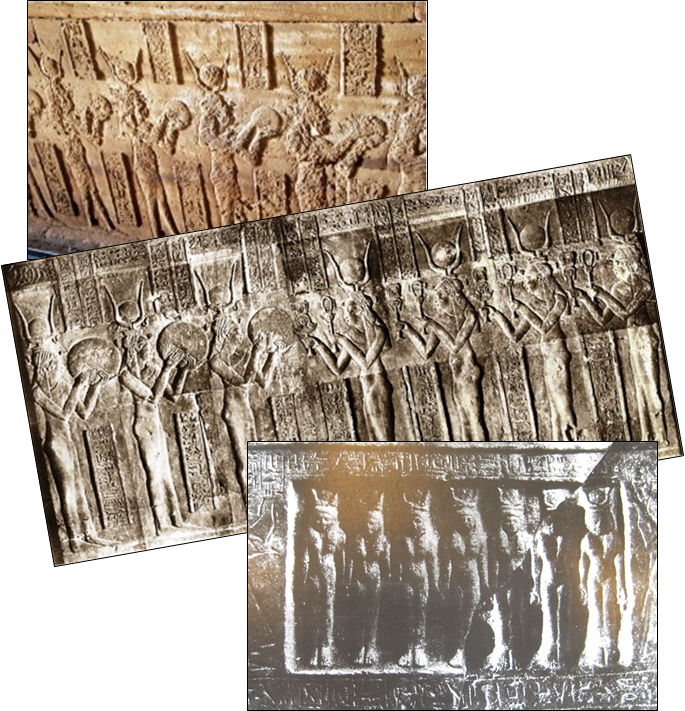 At some point in Egyptian culture, Hathor grew into a mini-pantheon of seven. Walls in various temples were adorned with carvings of Seven Hathors. Historians don’t know exactly when or why that happened, but I suspect that the wondrous goddess Hathor became intermingled with The Seven ethereals, who I’m confident were also known and loved by the Egyptians (as Thoth’s 7 Lords of Cycles). The qualities of Hathor—love, joy, abundance, generosity, and afterlife stewardship—are also qualities of The Seven as we got to know them during the years of INIT… so I think it was a natural connection for the Egyptians to make. There’s modern evidence to support that. In the 1980s, Tom Kenyon was a psychotherapist involved in brain research, and also a meditator who developed a gift of channeling. He had an unexpected encounter with the Hathors and, although they didn’t introduce themselves as a group of Seven, they certainly provided a rich library of information that resonates closely to what we were told by The Seven ethereals through ITC systems. Kenyon co-authored a book, Who are the Hathors, with Virginia Essene. Virginia Essene (a.k.a Venice Ostwald, 1928- ) is a professional therapist in grief counseling and an early advocate of hospice care in the US. In her later years, with advanced channeling skills, she wrote or participated in the writing of several metaphysical books that gained a wide readership in the New Age Movement, especially her landmark book, New Teachings for an Awakening Humanity (1994/95 updated edition), by The Christ and Virginia Essene. My spiritual mentor George Meek was a strong advocate of Virginia Essene’s work, so I read that book (even gave some copies away, on behalf of George Meek, at conferences where I presented) in the early 1990s. We are the Hathors. We come in love and with the sounding of a new dream reality for your earth. If you are ready to build the new world, we invite you to join us on a journey of the mind and heart. We are your elder brothers and sisters. We have been with you for a very long period of your evolution on this planet. We were with you in eons past – even in the forgotten days before any trace of us is known in your present written history. Our own nature is energetic and interdimensional…. In the past we have specifically worked with and through the Hathor fertility goddess of ancient Egypt. We also made contact with Tibetan lamas in the formative period of Tibetan Buddhism…. We are not saviors; we’re not messianic. We want to clearly step out of that projection so that the reader understands that we are simply elder brothers and sisters offering our understanding and what we have learned. You may take it or leave it but we offer it freely. In our understanding, the belief that different alien intelligences are going to save you, is just a projection of human unconsciousness. The hope that someone or something will save you, that you will not have to make any changes in yourself, that you will not have to be responsible, is unrealistic…. By offering our aid, however, we do not wish to interfere with your other spiritual helpers and cosmic relationships in any way, nor with any religious beliefs, affiliations or organizations of help to you. Even so, there is a great deal we would like to share…. Still, I sense a strong connection between The Seven who were in touch with our INIT group in the late 1990s, and “The Hathors” who convey information to Tom Kenyon in his meditations. More important, as I mentioned earlier, the Egyptians had a close relationship with their gods, especially Hathor. They also had a close connection to the demigod Thoth, who was in intimate contact with the 7 Lords of Cycles (who I believe were The Seven working with our INIT group in recent years). If the Egyptians interrelated Hathor with the 7 Lords of Cycles (as I suspect was the case), then The Seven ethereals of modern times and the Seven Hathors of ancient Egypt are most likely the same cluster of finer spiritual beings assigned to work closely with humanity on Earth over the eons. This entry was posted in Uncategorized and tagged ancient egypt, Atlantis, hathor, lords of cycles, ra, seven hathors, Thoth. Bookmark the permalink. The work of INIT, which I initially-discovered from reading Mark’s books – particularly “Conversations Beyond the Light” and “Miracles in the Storm”, has been a life-changing discovery for me. The evidence is there, and these people touched upon something quite special back in the mid-to-late 1990’s. Worlditc.org is what got it all started for me. Also, reading through the INIT journal publications is very moving – just to know what these people were experiencing and discovering – and the gifts that arrived to our world from other realms. I hope more people are able discover this as you and I have. Thanks Julie, you made my day. Ever since I was a kid I always wished to understand as much as possible about the world… probably some kind of karmic need I brought to this lifetime. In any case, I’ve always been searching, but ITC and The Seven provided a giant leap of knowledge that made my wish come true. Their information has helped me tie a lot of pieces together, especially the spiritual side of life that I’d always denied… also our distant past. If this site can help people connect to God and their ancient spiritual heritage, then I’ve done my job. Ricky and John, I always look forward to your comments here. God bless you both! Thank you Mark. This is great information and reading…infinitely more meaningful that what passes as “news” or “history” from the mainstream media or status quo historians. Unless we start teaching history correctly, we are bound to repeat it. For instance, we have been entrained to think that war is the normal thing to do. We have been at war for 95% of the time since Christ lived. I maintain that even in a noble-savage world war is not normal. Our savage part needs to evolve, and the historians and media need to do their part to assist this evolution. As always, it’s a pleasure and privilege getting your take on all of this. I agree with your comments, as usual……….. Thanks Randall, Happy Father’s Day to you too.